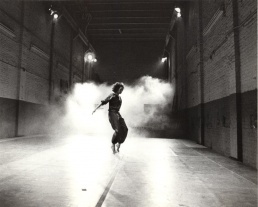 Trisha Brown in Accumulation (1971). Photo Nathaniel Tileston, 1979. Opal Loop / Cloud Installation #72503, 1980. Photo: Harry Shunk. Trisha Brown. Photo: David Seidner. Trisha Brown (1936-2017) was an American choreographer and dancer, and one of the founders of the Judson Dance Theater and the postmodern dance movement. Trisha Brown, Watermotor, 1978. Film by Babette Mangolte. Man Walking Down the Side of a Building, 1970. Floor of the Forest, 1970. Walking on the Wall, 1971. Son of Gone Fishin', 1981. For M.G. : The Movie, 1991. One Story as in falling, 1992. Another Story as in falling, 1993. If you couldn't see me, 1994. How long does the subject linger on the edge of the volume..., 2005. I love my robots, 2007. I'm Going to Toss My Arms – If You Catch Them They're Yours, 2011. Water Motor, short film, actress, 1978. L’orfeo, favola in musica, TV film, choreography and stage manager, 1998. Trisha Brown Dance Company, Lateral Pass, 1986. Babette Mangolte, "A Portfolio of Photographs of Trisha Brown's Work", October 10, Autumn 1979, pp 38-50. 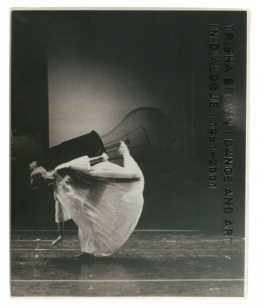 Babette Mangolte, "Trisha Brown: Portfolio", October 140, Spring 2012, pp 45-53. Trisha Brown: danse, précis de liberté, Centre de la Vieille Charité, Marseille, 20 Jul-27 Sep 1998. Curated by Michèle Doucet. Trisha Brown: Dance and Art in Dialogue 1961-2001, Tang Teaching Museum and Art Gallery, Skidmore College, 1 Feb-1 Jun 2003; New Museum, New York, 10 Oct 2003-25 Jan 2004; Henry Art Gallery, U Washington, Seattle, 20 Mar-18 Jul 2004. Curated by Hendel Teicher, independent curator, and organized in collaboration with the Addison Gallery of American Art, Phillips Academy, Andover, Massachusetts. Trisha Brown: Drawing on Land and Air, USF Contemporary Art Museum, FL, 12 Jan-3 Mar 2007. Brochure. Brown's choreography, drawings and performances at documenta 12, Kassel, Jun-Sep 2007. Trisha Brown: So That the Audience Does Not Know Whether I Have Stopped Dancing, Walker Art Center, Minneapolis, 18 Apr-20 Jul 2008. Part of Year of Trisha programme. Off the Wall: Part 2 — Seven Works by Trisha Brown, Whitney Museum of American Art, New York, 30 Sep-3 Oct 2010. Featured the Trisha Brown Dance Company, on the occasion of the company's 40th anniversary, performing works from the 1970s. On Line/Trisha Brown Dance Company, MoMA, New York, 12-16 Jan 2011. A program of performances; in conjunction with the exhibition On Line: Drawing Through the Twentieth Century. Laurie Anderson, Trisha Brown, Gordon Matta-Clark: Pioneers of the Downtown Scene, New York 1970s, Barbican Art Gallery, London, 3 Mar-22 May 2011. Trisha Brown Dance Company, Dia:Beacon, New York, 14-15 Nov 2009 & 13-14 Feb 2010 & 1 May 2010. A series of performances. Early Works, from Trisha Brown, by Trisha Brown Dance Company, Serralves Museum and Park, Porto, 21-24 Apr 2011. Program of performances. Trisha Brown: In a New Body, Bryn Mawr College, 2015-16. Festival, curated by Lisa Kraus. Trisha Brown: Dance and Art in Dialogue 1961-2001, 2003. Off the Wall, Part 2, New York: Whitney Museum of American Art, 2010. Sally Sommer, "Trisha Brown Making Dances", Dance Scope, Spring 1977. Trisha Brown, Yvonne Rainer, "A Conversation about Glacial Decoy", October 10, Autumn 1979, pp 29-37. 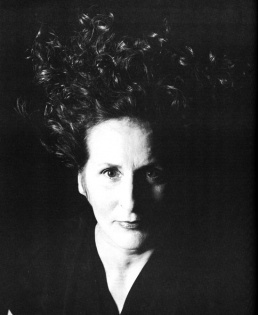 Marianne Goldberg, "Trisha Brown: All of the Person's Person Arriving", The Drama Review: TDR 30:1 (1986), 149-170. Marianne Goldberg, "Trisha Brown's Accumulations", Dance Theatre Journal 9:2, Autumn 1991, pp 4-7. Yvonne Rainer, "Trisha Brown", BOMB 45, Fall 1993, pp 28-33. Brown in conversation with Klaus Kertess, 2004. Video. Interview at documenta 12, 2007, 3 min. Video. 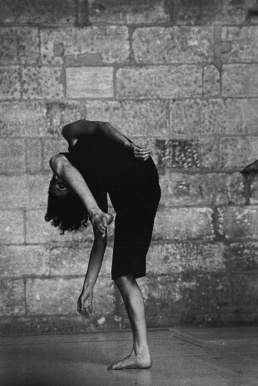 Susan Rosenberg, "Trisha Brown's Notebooks", October 140, Spring 2012, pp 3-17. Mona Sulzman, "Choice/Form in Trisha Brown's Locus: A View from Inside the Cube", Dance Chronicle 2:2, 1978, pp 117-130. 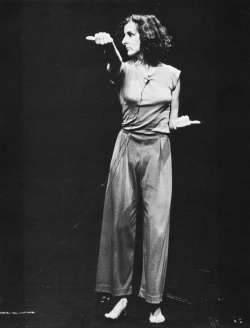 Marianne Goldberg, "Set and Reset, Trisha Brown and Company, Brooklyn Academy of Music, October 1983", Women and Performance: A Journal of Feminist Theory, 1984, pp 158-159. Sharona Kahn, "No to No: Trisha Brown, Lucinda Childs, and the “No” Manifesto", 2009, 34 pp. Douglas Crimp, "You Can Still See Her: Douglas Crimp on Trisha Brown", Artforum, Jan 2011, pp 154-160, ARG. Marianne Goldberg, "Trisha Brown", in Fifty Contemporary Choreographers, eds. Martha Bremser and Lorna Sanders, London: Routledge, 2011, pp 37-42. Susan Rosenberg, "Trisha Brown: Choreography as Visual Art", October 140, Spring 2012, pp 18-44, ARG. Amanda Jane Graham, "Out of Site: Trisha Brown's Roof Piece", Dance Chronicle 36, 2013, pp 59-76, ARG. Marianne Goldberg, "Trisha Brown", Oct 2015. Biographical sketch by Elizabeth Zimmer, Dance Heritage Coalition, 2012. Obituary: Wendy Perron (Dance Magazine).